Continuing with Pomegranate Week 2010 here is a fabulous rice recipe! For the POM Wonderful Dinner Party I definitely wanted to make a meal that was inspired by Persian flavors. I went through my cookbooks for inspiration and much to my delight I found a recipe that got my creative juices going. What I ended up with was a delicious rice steamed with spices and cilantro topped with pistachios and pomegranates! YUM! 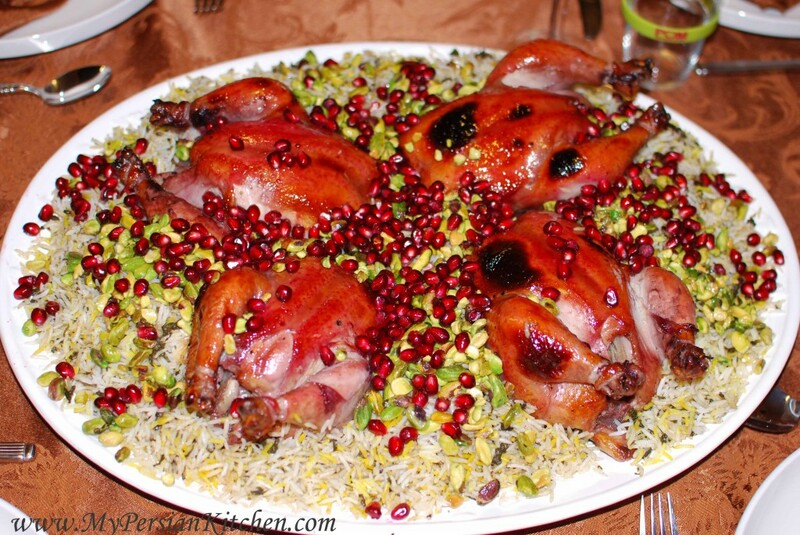 The rice was served with Pomegranate and Lime Glazed Cornish Hens. I know you are all used to my step by step photo recipes, but unfortunately I didn’t get a chance to take pictures of this dish when I made it. Par-boil rice according to Cooking Rice for Polow Post. Bring 5 tablespoons of water to a boil. Add saffron and allow to brew for a few minutes. In a small bowl mix ground angelica and coriander together. Rough chop cilantro and season with salt. Pour 2-3 table spoons of canola oil in a non-stick pot along with 2 tablespoons of water and 2 tablespoons of brewed saffron. Mix well together and add a couple of spatulas of rice. Mix well together and gently flatten the rice against the bottom of the pot. Sprinkle some of the spice mixture on top of rice along with 1/3 of cilantro. Add 1/3 of rice, top with 1/2 of remaining spices, and another 1/3 of cilantro. Gently mix together until the spices and cilantro are mixed with the rice. Repeat until you finish with one layer of white rice. Make sure that rice is in the form of a pyramid. Create 5 holes in the rice with the back of your spatula. Cook rice covered on high for 10 minutes. Melt 3 tablespoons of butter and mix with remaining brewed saffron. Pour over rice. Place a kitchen towel over the lid of the pot and place back on pot. Cook on low for 1 hour. Just before serving rice place pistachios in a pan and saute for just one minute while constantly shaking the pan. Add 2 tablespoons of butter and a sprinkle of salt. Allow for the butter to melt and get bubbly. Make sure to shake the pan so that the pistachio and butter don’t burn. Once butter has melted and pistachios have warmed through, remove from fire. 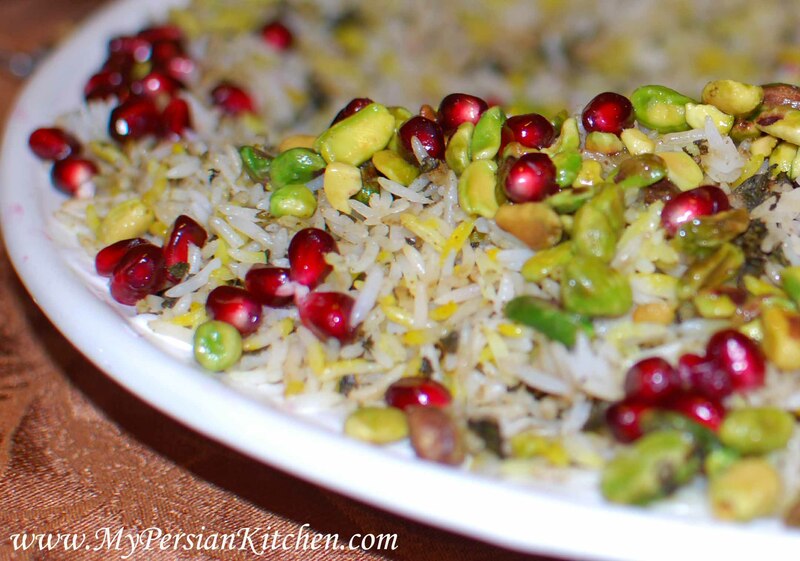 Place rice in a serving dish, top with pistachios and pomegranate seeds. Cut tahdig, crusty rice at the bottom of the pot, into small pieces and serve in a different dish. Tomorrow I will post the Pomegranate and Lime Glazed Cornish Hens’ recipe! *For the vegan readers: you can easily make this rice and substituting regular butter with either vegan butter or canola oil. 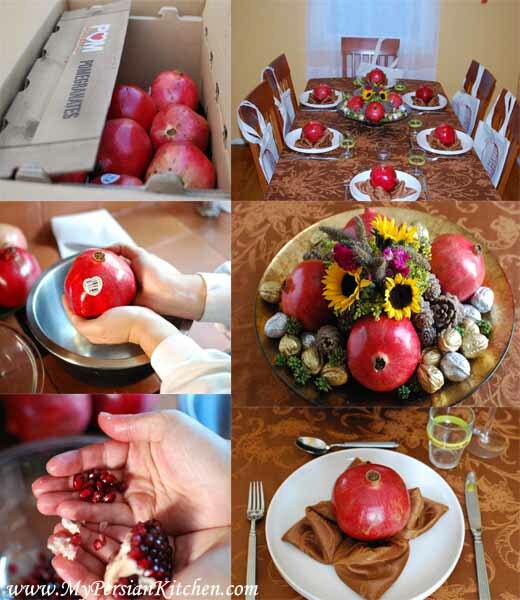 yourpomegranate rice looks delicious;i will have to try it;thanks for the recepie. Just Love the look of this recipe… definitly have to try.